Duke’s OceanFest coincides with the 125th anniversary of Duke’s birthday (August 24, 1890). The festival will feature a thrilling menu of competitions and events, which Hawai’i residents and visitors can enjoy in many cases, as participants. The events include surfing competitions for teens, amateurs, pros, tandems and the physically challenged, a wounded warrior canoe regatta, stand-up paddling, a one-mile ocean swim a lifeguard waterman challenge, surfboard waterpolo, paddle boarding, beach volleyball, movies and music on Waikiki Beach, a lu’au and a special lei draping of Duke Kahanamoku’s statue. center of understanding and fellowship. power, to give mana to, possessed of mana, power. In addition, the Bernice Pauahi Bishop Museum is currently honoring the life and accomplishments of Duke Kahanamoku with a special exhibit running through November 30, 2015. The museum is open daily from 9:a.m. to 5 p.lm. except Tuesdays. Also, Hawai’i News Now will be recognizing the life and legacy of Duke Kahanamoku on August 24, with the KGMB-TV broadcast of two one-hour documentaries. 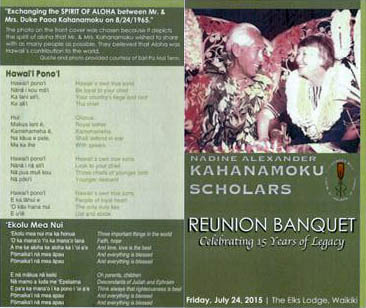 “Duke Kahanamoku: Hawai’i’s Soul’ at 8 p.m., followed by “Kahanamoku: A Legacy of Healing” at 9 p.m.
On July 24, 2015 at The Elks Lodge, Waikiki the Nadine Alexander Kahanamoku Scholars celebrated 15 years of Legacy with a Reunion Banquet. Purpose of this scholarship is to ensure that any student, and in particular any part-Hawaiian student, who wishes to attend the John A. Burns School of Medicine will not be turned away because of finances. The scholarship is intended to assist recipients with tuition, books, fees and other expenses associated with a four year course of studies at the John A. Burns School of Medicine. The prospective recipient should have satisfactory academic performance. The Program hopes to: 1) recruit Native Hawaiian students from JABSOM; 2) enrich the experience of the scholars; 3) emphasize Hawaiian culture in medical education, 4) orient the scholars to Native Hawaiian beliefs and practices as well as the holistic approach to health care; 5) create a cadre of physicians committed to providing care for and improving the health of Native Hawaiians and most importantly, 6) facilitate service to the Native Hawaiian community by having scholars participate in community service activities Community service performed as a group (“Kahanamoku Scholars Learning Community”) is strongly encouraged. In addition, the community service is expected to take place outsideof the JABSOM curriculum. This entry was posted in General on August 20, 2015 by Blaine Fergerstrom.